Hotel Migmar is ideally situated amidst scenic landscape of Thimphu, on the expressway and about one km from city centre. 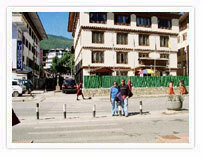 It is built on contemporary theme and yet has a unique blend of Bhutanese architecture and modern amenities. 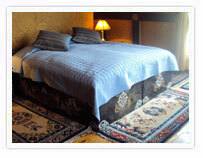 The hotel offers 17 standard rooms, each having an approximate area of 156 sq. feet and equipped with 2 single sized bed with 8" to 10" mattress, LCD Screen with DVD attached, Mini Bar, Tea Coffee Maker, Table lap between two beds and a broad back light at the back of the bed, all walls with wallpaper cloth (silk) in different patterns, well furnished bath room with auto heating system and Chandelier at the center of the room. The hotel also has 8 Deluxe rooms each having an approximate area of 400 sq ft with similar amenities. Hotel’s Executive Suites of 625 sq ft is elegantly designed and offer required modern facilities. Lavish buffets are laid daily in the multi-cuisine restaurant serving Bhutanese, European Oriental and Indian delicacies. The all day MIGMAR Restaurant is the perfect option for a quick snack, beverages or main courses with an experience of the great outdoors.The bar by the restaurant offers vast choice of international and local beverages. Hotel MIGMAR offers state-of-the-art conference facilities in an environment conducive to board meetings, business presentations or hosting an official or a house party. The equipments like Microphones, audio system, projectors and plasma TV can be availed. The Banquet Hall has a capacity of 100 to 150 people in theatre style sitting arrangement and up to 25 to 30 people in executive style arrangement. Located right in the heart of the city overlooking sparkling river meandering across the valley, Kisa hotel is the unique blend of Bhutanese traditional and contemporary architecture. Surrounded by panoramic view of eastern Himalayan range,Kisa hotel Thimphu the newly built hotel offers several categories of luxury accommodation. Elegantly adorned with classical paintings and frescos, its 35 guestrooms equipped with modern amenities reflect region’s traditional art and colours. Located right in the heart of the city center with easy access to all shopping areas and places of interest, Hotel Jumolhari is one of the leading hotel in Thimphu with traditional Bhutanese hospitality and a distinctive boutique style décor. In the heart of rolling mountains and drifting mist, the Thimphu Druk Hotel, offers a choice of Executive floor and Regular Floor with 53 elegantly appointed rooms. Located in the heart of the capital city of Thimphu, it is one of the finest hotel in town with its modern amenities and quality services. For, Banquet, Conferencing, the hotel offers two fully air - conditioned halls those can serve as much as 150 people at a time. The round the clock Business Centre offers professional expertise for any corporate events. The Druk Health Club is equipped with modern Gym, Sauna, Steam Bath and massage to rejuvenate your mind, body and ‘Looks’ – the beauty parlour provides service of hairdressing, cosmetic, manicure etc. Bar, Multi Cuisine Restaurant, Business centre, Beauty salon with Aroma Therapy, Steam & Sauna, Laundry Service, Cable / Satellite television. Situated in the heart of city overlooking wangchuk hotel thimphu Changlimethang stadium and the sombre mountains, the hotel features 20 well appointed rooms, all with attached bath, 24 hour running hot & cold water, international Direct Dial telephones, cable Television and room heating facilities. Looking into the comfort of clients the hotel has been well equipped with imported items of linens, mattresses and beds, cutleries & crockery etc. The furniture, custom designed and made in Bhutan, provide a matching ambience to the rooms with its simplicity and practicality of its design. Here major attraction here is the reception desk counter built in purely traditional style amidst elaborate Bhutanese designs with an alter theme attached to it. 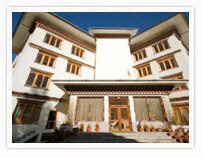 One of the finest properties in Thimphu, elegantly situated on the east bank of Thimpu River. It presents commanding view of town and the valley. An interesting feature of the place is the fact that all the rooms overlook Thimphu River and have private balconies offering panoramic vistas. 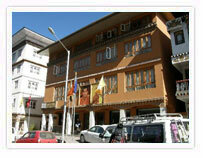 The hotel is one of the best in Thimphu and quite good in all respects, with all the necessary amenities. The hotel staff are very pleasant, simple and friendly. Even the most discerning guest wouldn't find too much to complain about in River view Hotel. 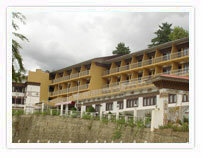 50 spacious and well decorated rooms with attached bath, running hot & cold water, bar with the selection of international and Bhutanese beverages, restaurant serving continental, Chinese, Indian and Bhutanese cuisine, IDD telephone, Laundry, Money Exchange, Conference room, Heating, Business Centre, TV, disco. This boutique guesthouse is tucked away from noisy city traffic below 15th century Changangkha Lhakhang with wonderful, sweeping views of the Thimphu Valley. The suites are modeled on a mixture of traditional Bhutanese style and service with modern design and soft tones creating a warm and inviting atmosphere. In addition Bhutan suites thimphu to the luxury accommodations, Bhutan Suites also offers fine dining, a bar, relaxing tea-lounge, Wi-Fi broadband internet access, room service, currency exchange and laundry service. Bhutan Suites is designed for the discerning travelers or occupants, and readily caters for both short term and long term stays. Hotel Dragon Roots is a quality hotel located in the heart of Bhutan’s capital town, nearby the best shopping and entertainment areas. The hotel is within easy reach of important cultural landmarks such as the Memorial Chorten, the TextileDragon Roots hotel Thimphu Museum, the Folk Heritage Museum, the Changangkha monastery and the impressive Thimphu Dzong, the seat of the Government. The hotel offers 30 elegant guest rooms with beautiful teak wood flooring and are equipped with television, telephone, heater and private bathroom with 24 hours running hot water. Hotel’s 70 seater restaurant is open from 7 a.m to 10 p.m, offering a variety of Indian, Chinese, Bhutanese and Continental dishes. It also has a well stocked bar with a fine selection of local and imported beverages. Hotel’s pleasant and elegant arcade features a handicraft shop, a coffee shop and a internet café, a strictly vegetarian restaurant, and a beauty parlour with massage and hairdressing facilities. 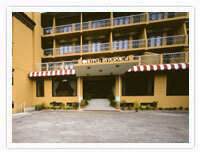 Guests’ can enjoy elegant sun bathed lobby where hotel’s foreign exchange and postal services are also located. Here conference venue is attractively furnished and can accommodate 40 to 50 participants. Conference equipments / facilities can be arranged on request. Cable TV, Mini Bar (in suites only), Telephone / IDD, Elevator, Laundry service, Parcel and Postal service, Foreign exchange, Daily newspapers, Conference room. 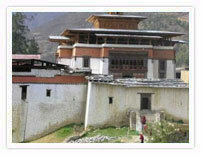 Hotel Pedling is owned by a learned and greatly revered Buddhist Lama, Gangtey Trulku. All proceeds from the hotel go in meeting the daily expenses of eight nunneries and religious institutions spread across the country. Ideally located in the hub of the capital, the hotel is close to shopping outlets, restaurants and Thimphu’s prominent sightseeing places. It provides comfortable well furnished 39 guest rooms equipped with first class bathrooms, TV, work desks and touch dial telephones. All suites and deluxe rooms are with a mini bar also. 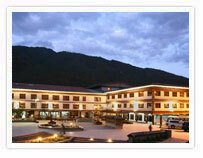 The hotel’s menu offers imaginative, international cuisine complemented by superb Bhutanese traditional food. Guest can select from continental, mandarin, local and Indian cuisine. 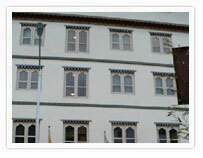 The hotel also offers a fully equipped day-conference center, facility of foreign exchange, laundry and dry cleaning. The hotel staff and management believe in taking special care of customers. Discreet and personable, the hotel's staff works to make every guest feel welcome.